This year we were able to stay home home for Thanksgiving. It is tough traveling with children and lately we've been run ragged. So this is our catch up weekend. I have sooo much to do LOL. I forgot to take picture of the meal my HUSBAND made...it was great though. I got clean up duty but I was more than happy to do that since he cooked mostly. The baby is currently sleeping and so here I am online...I think I am suppose to be organizing something but oh well. Here's what I whipped up in 5 minutes here and there this week. It's the start of an apron from a pattern by Indygo Junction. Perhaps I will finish it this YEAR haha. Here is the 'fruit' of some of my organizing so far. 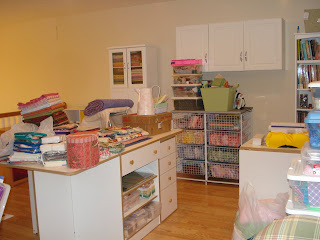 I organize and alternate with sewing so it's taking awhile....sewing is waaay more fun. I just ADORE my loft space. It is turning out so much better than I ever imagined. And Day #9 Q.A.D. 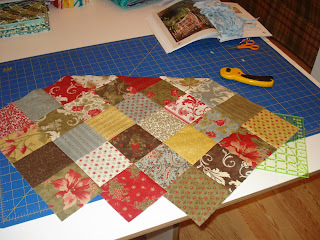 Little Civil War quilt from Fat Quarter Quilts by Darlene Zimmerman. I love that book. 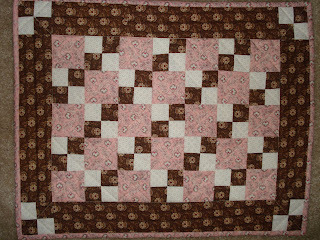 I could make nearly every quilt in it!